What Is An Inverter Welder? And What Is The Best Inverter Welder On The Market? The inverter welder is a new style of welder that has a lot of advantages over conventional welders that most are accustomed too. These welders such silicon technology that's sophisticated as compared to the aluminum and copper transformer that are found in the traditional welder. People have been slow to adapt to this new welder but it's not a reliable and it costs you less money when you us it and it's being widely adopted. Best American Made Inverter Welder? 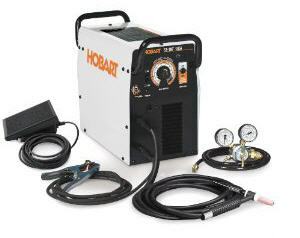 Hobart EZ TIG 165i Inverter-Based AC-DC Welder. This welder is awesome, and it's American made (Miller manufacturers Hobart welders now). This Hobart is pictured above. Best Low Cost Foreign Manufactured Inverter? 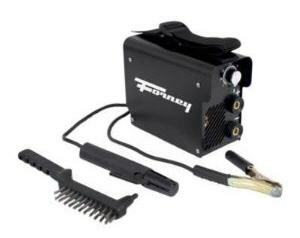 Forney AT-100 ARC-TIG Inverter. This welder is manufactured in Britain (by Clarke). One advantage that this new welder has is that it's compact and small. Since the welder is portable it's easy to carry around to job sites. The inverters use smaller transformers so they are compact, sleek, portable, and weight less. This is much different from a regular welder that is very cumbersome and they don't fit into small spaces. The inverter welder can do more jobs in less space and save you more time when you do use the equipment. An inverter welder consumes less power and it also operates on your regular household current. The lower power consumption of these units allows them to be plugged into normal wall sockets so they don't need any high voltage current to operate them properly. These welders can save you a great deal of money due to their lower consumption of power. Since they are smaller and use less power you don't need any industrial generators with them or use high voltage power. When you use the welder you can do the job in less time and you won't have as many poor welds as you would with regular welders. You can also fine tune these welders to do the job you need to do. There's power adjustment ranges with the welder so you can change it when you need more power. While these welders have great advantages they also have a few disadvantages too. You can use the welder on regular currents because the welder has high-tech components. These means that the welder can be fragile as compared to other welders and it can breakdown frequently due to the fact that the components just wear out faster. This means that over time the welder can end up costing you extra money if you have to repair it often or buy new parts for it on a regular basis. A regular welder is a simple construction and this ends up being more reliable over the long-term due to its simplicity in construction. The regular welders end up being cheaper long-term investments that don't break down as often. For this reason it tends to make the size and weight of these more cumbersome units less of a factor. While you do pay more for the features of an inverter welder the cost is well worth it. You get a welder that's very portable so you can take it almost anywhere and get your work done with it. These welders won't solve every problem and older welders won't break down as much but the inverter welder uses new technology and it's a solid option for all your welding needs. 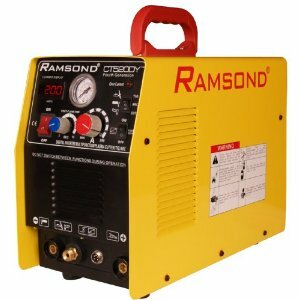 Ramsond Multifunction Digital Inverter Plasma Cutter, TIG, and Arc welder. With the Huagong Inverter Welder you have a high frequency of 20KHz. This inverter technology gives a lightweight, small volume which allows a lot of energy saving. But perhaps the best thing about this model is that with all its perks the most favourable is that it saves a lot of money on running costs. With its PWM control, the technology is advanced and allows the circuitry a wide-ranged voltage input of =15%. This delivers a great constant output current. 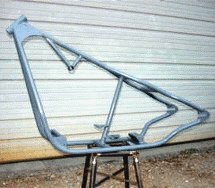 But along with this - a great perk in any welding shopping - is that it reduces splatter and fumes, it avoids mess and unwanted distractions when using your welder. With this comes an Adaptive Arc Force which improves the arc stability and stops electrocutes from sticking and adding to unwanted mess. A minor thing but a very useful point is that it has a very easy arc start that bends weld with ease and effectively. It has a hot start feature that gives off an excellent arc start, especially for difficult electrodes which can usually cause a problem with in the process of making. Although this inverted welder is not for those who are inexperienced it offers advantages that make its use simple. With its lightweight and small volume it allows you to move the welder into different positions to conduct the job with ease and speed. Along with this it has a great energy-saving technology in stored - MOSFET. The most amazing thing about this model, however, is that is has various protections against damaged risks such as overload of voltage, overload of current, voltage shortage and overheating. When buying an inverter welder it is important to know what it is going to be used for - for home use or business. The KENMAI Digital is a very versatile machine that has a very advanced MOG/IGBT technology installed. With its versatile nature is the ability to adjust the frequency to a high rate - reaching up to 60Hz. The ease of work is another crucial factor when welding shopping and this model has a fan-cooled, automatic protection of over-voltage. It does not just protect against that but also the over-current and thermostat used. It also has a moveable welding cable which will come in handy when working and even doing small jobs around the house. 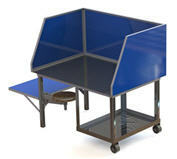 A brilliant feature of this model is its sound-proof appearance and less splash quality - when working at home these factors are a big part of any work and would be a great plus. Finally, the KENMAI Digital can suit all kinds of basic and acid electrodes. The Propser & Greatec is a very easy model to operate and very convenient. It can carry out a number of interesting jobs such as continuous welding for a long duration of time and disconnected welding. With this it can also provide a continuous wire feed without any interruption. Along with this it also has a very low splatter percentage - great when it comes to working at home or in a professional environment. The OEM MMA-200 has a very invert technology. With this comes its high frequency arc start and a balance automatic when voltage is waving. It has high affiance and small unload, saving 40% of energy than any other traditional welder. This seems to be the stand out thing about the OEM MMA-200 - its ability to save and cut costs that are usually extremely expensive. It also minimizes the light used - once again saving energy costs - but also has a high quality alongside it. It can easily arc small flash in a wonderful welding shape. The Juba MMA315 is a compact, light and power saving model that has automatic voltage pulsation and a compensation capability. It also is a very easy model to use when it comes to arc ignition - you don't waste time with this model. It has a good welding result with a deep weld pool and a high intension, as well as this is its stable welding current which is a great factor when it comes to low welding splatter.